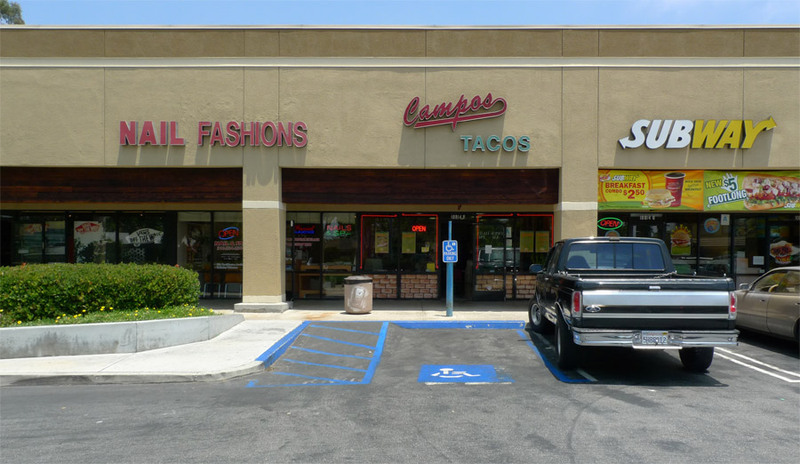 Campos Tacos is a mini-chain of five or ten restaurants scattered mainly around the Westside. 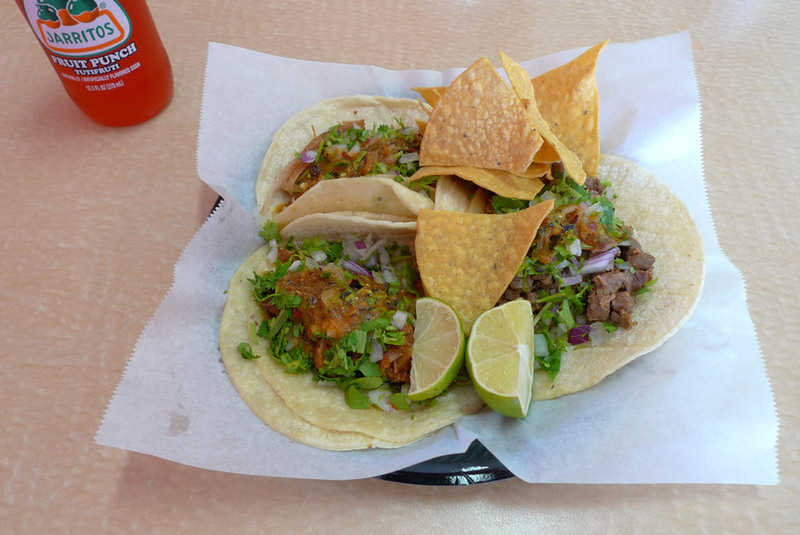 There was one on Venice Boulevard in Palms that became Pancho’s recently; they used to have some giant tasty al pastor tacos that you could wash down with a Negra Modelo. There is also a Campos Famous Burritos on Venice Boulevard at Motor Avenue that I visit frequently, but when I go to a place called “Famous Burritos”, I order a burrito. I’m not a troublemaker, so why would I deliberately defy such an explicit guideline contained within the name of the restaurant? Be advised that all these Camposes serve completely different food. The Burrito place has a very savory, chorizo-like al pastor that I enjoy in burrito format; but Campos Tacos on Jefferson in Culver City, where Carmen and I had lunch today, surprised me with a diametrically opposed al pastor of super fruity sweetiness. We found this suburban-looking taco shop in the middle of the big strip mall with the Target store. The television let us watch Argentina beat Mexico at the big sportsball tournament. I ordered one each of the al pastor, carne asada, and carnitas tacos, which were well above average in size and $1.75 each. They were served con todo, with a couple different kinds of salsa preapplied, and a handful of storebought-seeming chips that I nonetheless enjoyed with the spicy verde salsa from the salsa bar. I started off with the carne asada. The ordinary tortillas were hot, steamed, but not laminated, so I performed the tortilla offset maneuver on this big taco. My first bite was very satisfying. I tasted onions, cilantro and salsa in proper balance with a beefy steak flavor sparely seasoned with salt and pepper, and citrus from the lime I had squeezed above my tacos; but on subsequent bites, I was disappointed to find much of the steak too tough, resisting one’s ability to bite through it. Flavor was good, but texture was subpar. Next I ate the carnitas taco, the best of the bunch. Unlike the moist, grey carnitas at Famous Burritos, the carnitas here had a nice brown color and a dry consistency with good al-denteness. The addition of spicy green from the salsa bar helped round out this taco. Finally I ate the al pastor. Despite the very peppery-looking salsa, this taco surprised me by being the fruitiest, sweetest al pastor experience of the year, with a taste reminiscent of brown sugar. I liked it, but the carnitas was better, and I have to admit it was not better than the median of al pastor meats. Carmen ordered a hard shell taco with beef, which she declared “Better than Tito’s”. I took a bite and found it very tasty, with the crispy taco shell offering all the satisfactions of oily, freshly-deep-fried starches. A sign in the restaurant claimed that they have the best crispy tacos in town. That would be a fun project to verify.